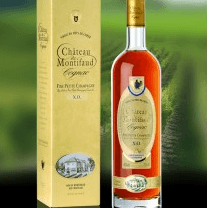 Château Montifaud Napoleon Cognac 46% Cigar 1er cru built for a cigar smoker. Chateau Montifaud Napoleon 46% Cigar 1er cru. Deep amber hue. Muted woody aromas are restrained by some heat in the nose. A rounded attack leads to a moderately full-bodied, fiery palate. Hot, clipped finish. Birthday gift cards or thank you card. The package is also suitable for postage.